University of Minnesota Press continues its stellar series of revised and updated plant books that began last year with Growing Perennials in Cold Climates, followed by Growing Shrubs and Small Trees in Cold Climates. Here now is the third and final entry: Growing Roses in Cold Climates. Different book, same result: an indispensable reference guide for gardeners of all ages and talent levels. The original version of this book was published in 1998, so an updated version was well overdue. 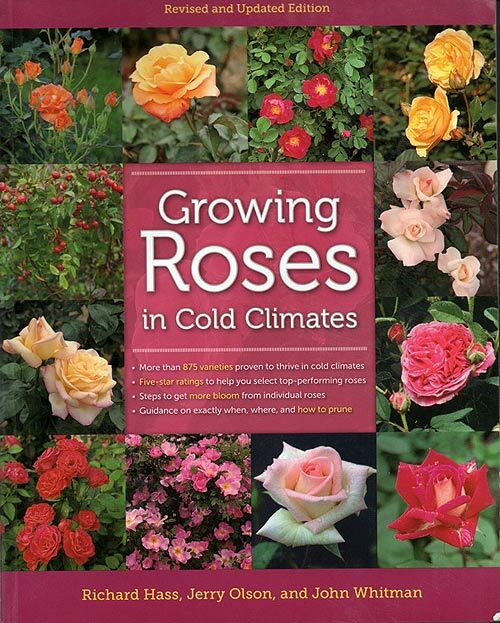 More than 875 varieties of roses proven to thrive in northern climates are included, with the book reflecting the many new and improved varieties that have entered the scene over the past 14 years. The book cannot be called incomplete; there are individual sections for climbing roses, floribunda roses, grandiflora roses, hybrid musk roses, hybrid tea roses, miniature and miniflora roses, old garden roses, shrub roses, species (wild) roses and tree roses. What distinguishes the book is the stellar photography, concise writing and complete instruction in how to plant, where to plant, and how to care for each rose variety. Winter protection (for those roses that need it) is, of course, included. Rewritten, updated and otherwise revised, this soft-cover version of the book drops ten dollars in price ($34.95 US) versus the 1998 hardcover edition. Gardeners in zones 6-8 do not have a better all-purpose rose book, and should realize that virtually all of the roses included are ones they also grow. In other words,you need not be a northern gardener to benefit from this book. For those in the north, if you want to grow roses, it is indispensable.